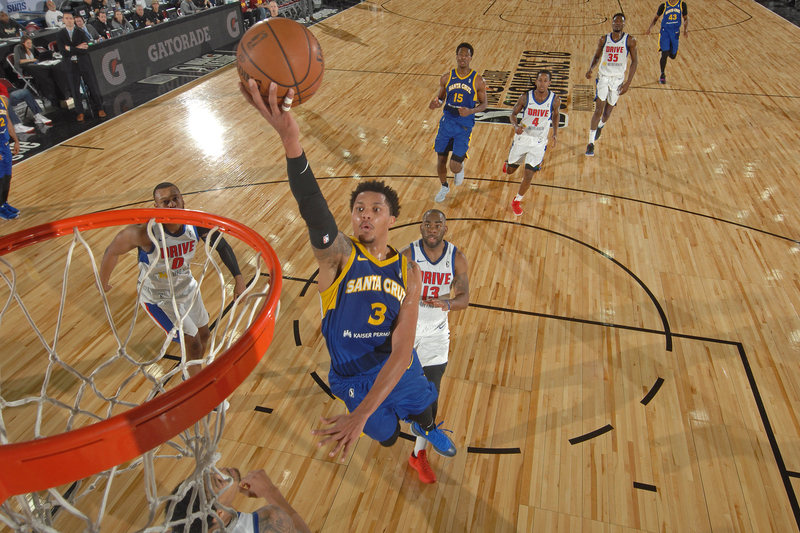 SANTA CRUZ, California — Damion Lee was shaking with excitement after learning he would play for USA Basketball just like his future brother-in-law, NBA All-Star Stephen Curry, once did. USA Basketball told Lee on Feb. 16 that he was a replacement candidate for the FIBA Basketball World Cup qualifying team. After guard Marcus Thornton signed a 10-day contract with the Cleveland Cavaliers, Lee got the call from USA Basketball director Sean Ford on Feb. 21 that he would be added to the roster. Just as excited to get the news was Lee’s fiancée, Sydel Curry, Stephen Curry’s sister. Lee, a guard with the G League’s Santa Cruz Warriors, was about 60 miles away in Oakland when he got the call. Ford told Lee to get to Santa Cruz as soon as possible so he could get settled that night to prepare for his lone practice on Feb. 22 before play began in Kaiser Permanente Arena. Lee’s USA Basketball career likely will last just two games, a win over Cuba on Feb. 23 and a game against Puerto Rico on Monday (11 p.m. EST, ESPN). Team USA is expected to use young NBA players in the third window of World Cup qualifying at Mexico on June 28 and at Cuba on July 1. Even so, Lee is honored to play for the USA and can now say he was a member of the national team. “It actually meant a lot,” the 25-year-old Lee said. “I’m playing with USA on my chest. I’m playing for the team that I have been watching since I was younger. It really just means everything playing for this country. Stephen Curry won a gold medal while playing for USA Basketball’s FIBA World Cup team in 2010 and 2014. The Golden State Warriors guard was very excited that Lee had a chance to play for USA and congratulated him after he landed the assignment. Coincidentally, both Stephen Curry and Lee have worn No. 4 for USA Basketball. “It’s a great experience for him to get some recognition for the type of player he is,” Stephen Curry said. “It’s kind of cool that the G League guys get the opportunity to get that exposure. For him, it is just a confidence building coming back from his knee injuries, knowing that he is really working hard to get his body right. His game is coming along with his flow and rhythm. Lee received some advice from Stephen Curry about playing for Team USA. 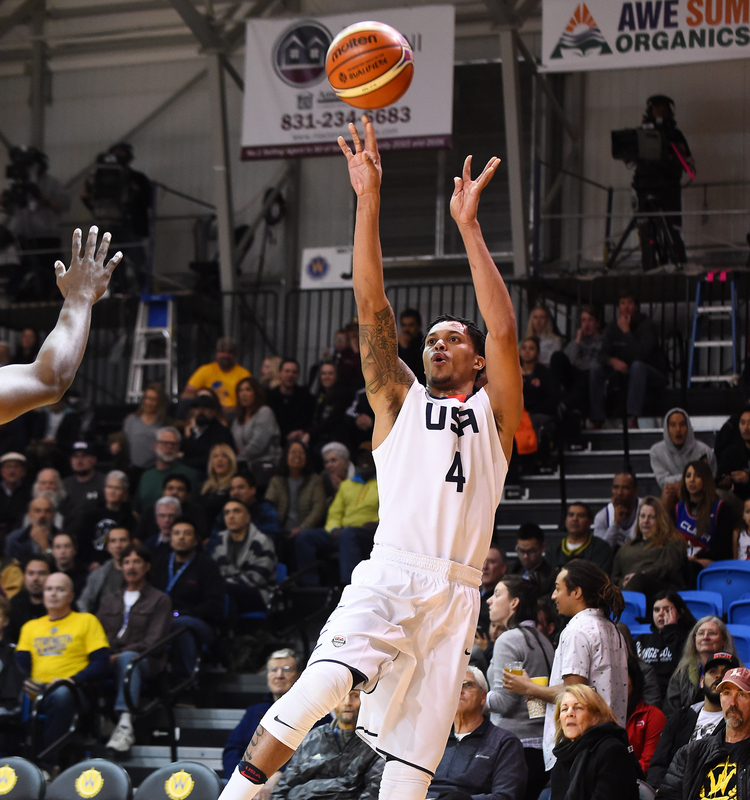 The USA Basketball assignment is a boost for Lee, who has faced his challenges in recent years. Lee suffered a torn anterior cruciate ligament in his right knee while playing at Drexel University in 2013. He transferred to the University of Louisville for his senior season in 2015. After going undrafted in 2016, the 6-foot-6 combo guard played in two preseason games for the Boston Celtics. He joined the Maine Red Claws of the then-D-League but suffered another season-ending torn ACL. Santa Cruz acquired Lee in a three-team trade on Aug. 24, 2017. He is averaging 14.8 points and 4.8 rebounds in 28.6 minutes per game in 32 contests this season and said he is still working to regain his explosion and quickness from before the knee surgeries. Lee said he has been receiving some interest from NBA teams and hopes to be called up from Santa Cruz this season. “There is hope. But my main goal entering this season is staying healthy throughout and showing teams, showing organizations that I have durability and I can be healthy throughout the course of a year,” Lee said. Stephen Curry and his brother, injured Dallas Mavericks guard Seth Curry, both spent time last offseason helping Lee develop his game. Lee said that both “preach” to stay confident and continue to get better daily, and that his unselfish play doesn’t go unnoticed and is always needed in the NBA. Lee added that he regularly reaches out to them for advice. Stephen Curry believes that with continued development, Lee will end up in the NBA. “He just has a high IQ for the game,” Curry said. “He can shoot the crap out of the ball. He is just a smart player for his size. Playing 2 guard, I think he can transition really well to a bunch of different systems in the league. Obviously, it is unfortunate the injury he had last season. The Curry brothers and Lee bonded over basketball. Stephen Curry is excited about the “solid guy” joining his family. Lee asked Sydel Curry to marry him in November 2017. She regularly attends her fiancé’s games in Santa Cruz and was on hand to see him score three points in 20 minutes during USA’s 84-48 rout of Cuba. Not long after the game was over, Lee shared some words with his future wife, and they also shared a kiss before he headed into USA’s locker room.